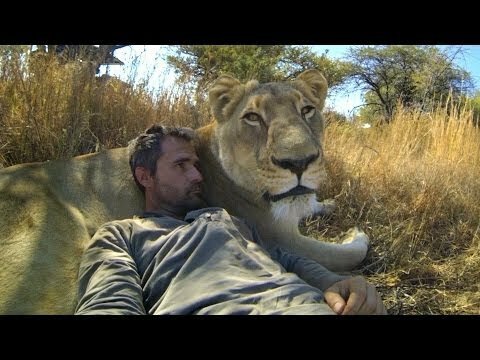 GoPro recently teamed up with self-styled zoologist Kevin Richardson to get an inside look at his uncanny relationship with lions, capturing footage of the iconic big cats in stunning detail. Richardson, often referred to as the lion whisperer, is best known his unconventional methods in working with lions and hyenas on the grounds of his wildlife sanctuary in South Africa. Despite the obvious dangers of his approach, Richardson believes the awareness he's helping to raise makes these potentially hazardous animal friendships well worth the risk. "Obviously one realizes the danger when working with animals of this caliber, I've weighed the pros and I've weighed the cons, and the pros far outweigh the cons." Although African lions are not currently listed as an endangered species, Richardson says that population declines from habitat loss, hunting, and other conflicts with humans could soon earn them that distinction.